The other day, I made this heart cup cozy using front post half double crochets. 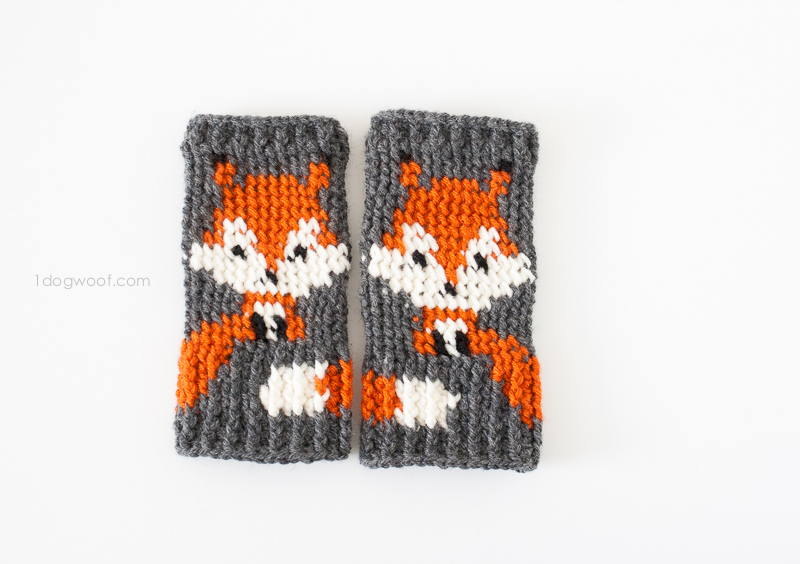 Today I’m sharing my my fox fingerless gloves crochet pattern using front post single crochet stitches. And I did it all with my new favorite Clover Amour hooks. If you win the giveaway below, they may become your favorites too! 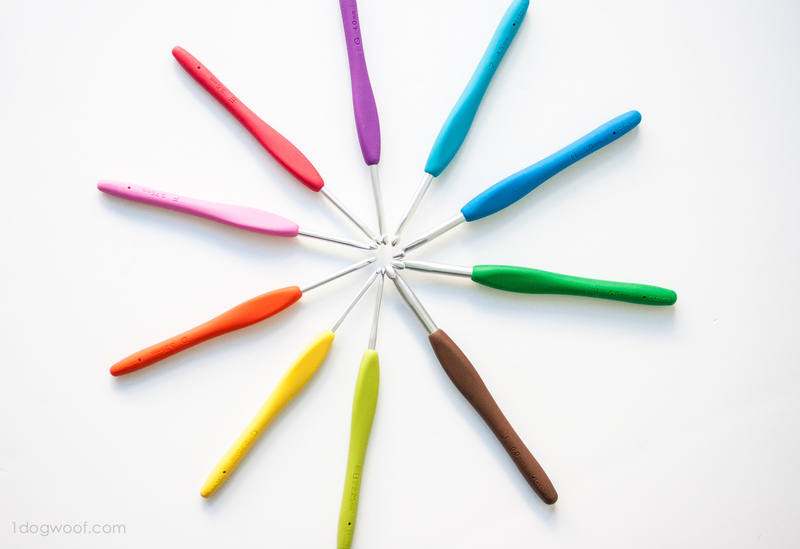 I’ve used Susan Bates metal crochet hooks for years and really never had a problem with it. I hold my hooks like I hold a knife, because I could never figure out how to use a pencil hold with such skinny slippery hooks. 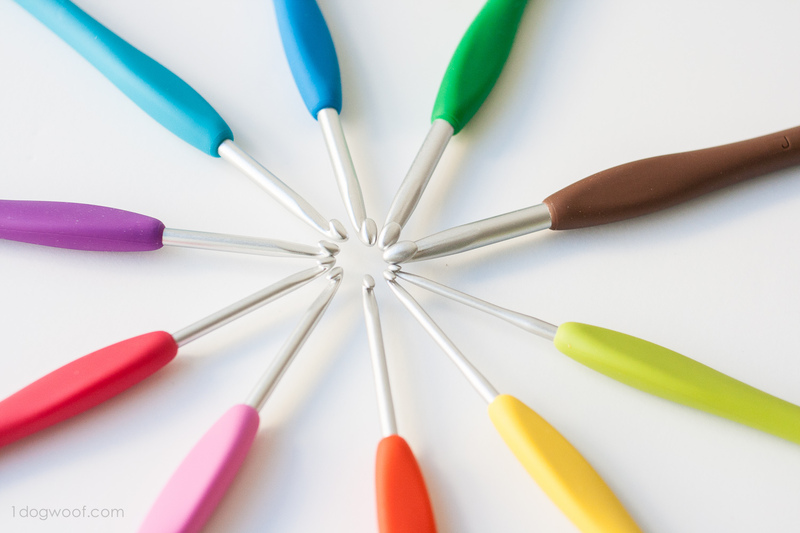 Then Clover USA was so generous in letting me review their Amour crochet hooks, and I was ‘hooked’. It’s not that I’ve never tried ergonomic hooks before. I bought a set on Amazon once just to try, but I realized very quickly how important the shape of the hook itself was to crocheting success. Having your yarn catch on the hook every. single. time you move yarn is seriously annoying. Here’s a look at the difference between a Susan Bates (left) hook and a Clover hook (right). The hook on the left is completely straight along the top/back, so the yarn has no trouble traveling along the length of the hook. The one on the right tapers slightly, but the transition is really smooth, so the yarn also has no trouble traveling back and forth. I also found that I liked the roundedness of the hook itself because I could pull my yarn through a loop easier and it never caught on the previous row. The big difference comes on the smaller hook sizes. 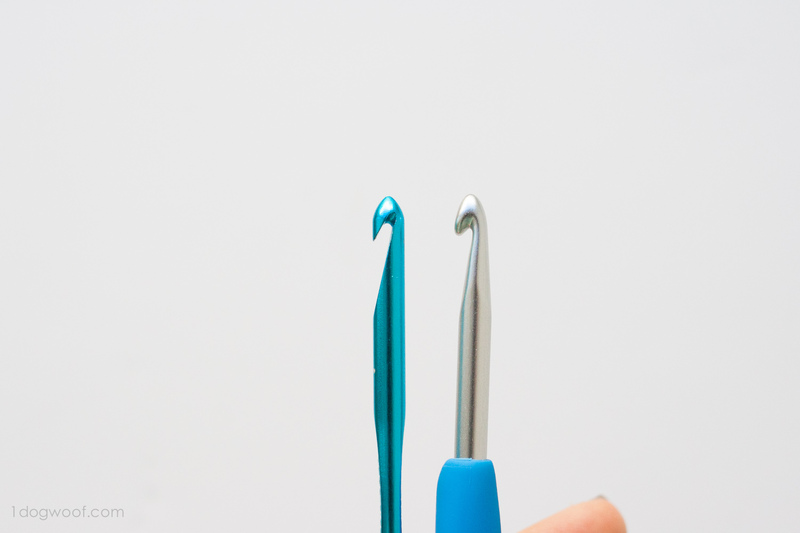 Imagine holding one of these hooks for hours on end – which one would you prefer? Yikes, no wonder I couldn’t hold the metal hook in a pencil-hold – there was hardly anything to hold! 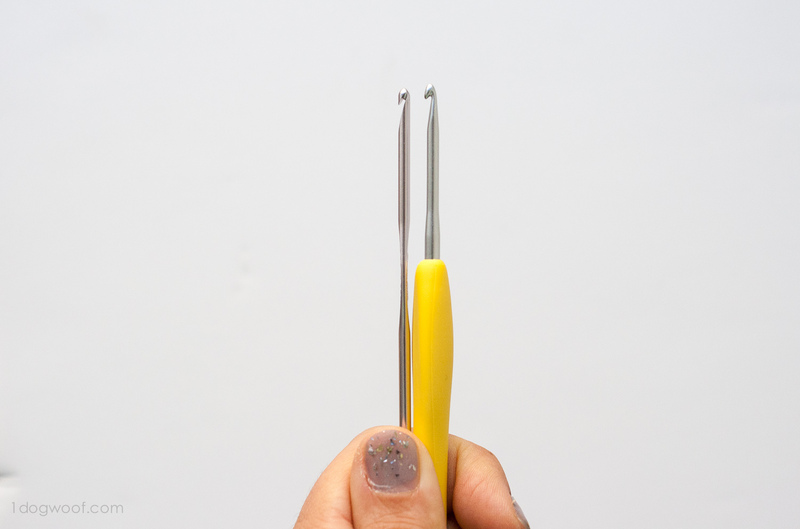 With Clover hooks, what your hand feels is essentially the same, no matter what the hook size, so I don’t have this jarring feeling if I switch hook sizes in the middle of a project. The shape of the hook is just right in order to let the yarn slide on and off easily, meaning I could crochet quickly. And the soft non-slip grip meant I could crochet longer. And the colors, well, they just make me happy! 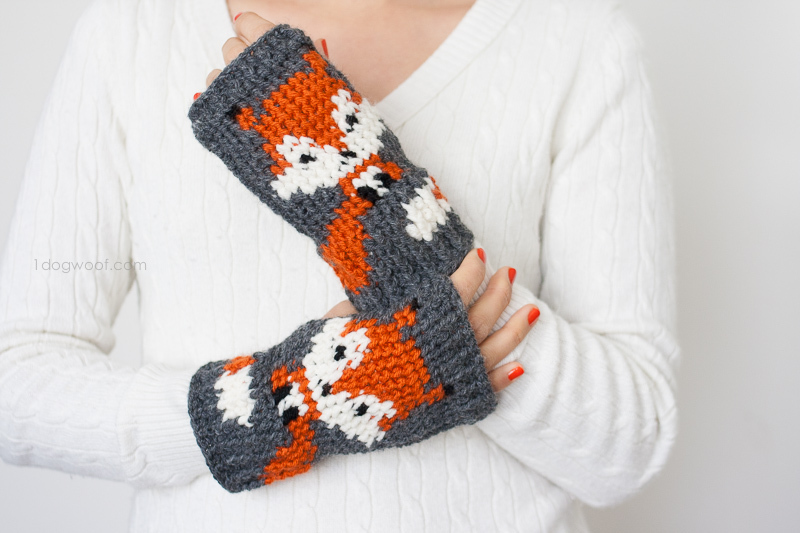 No matter what crochet hooks you use, there are these fun fox fingerless gloves you can make for yourself. Is it a handwarmer or a fingerless glove? 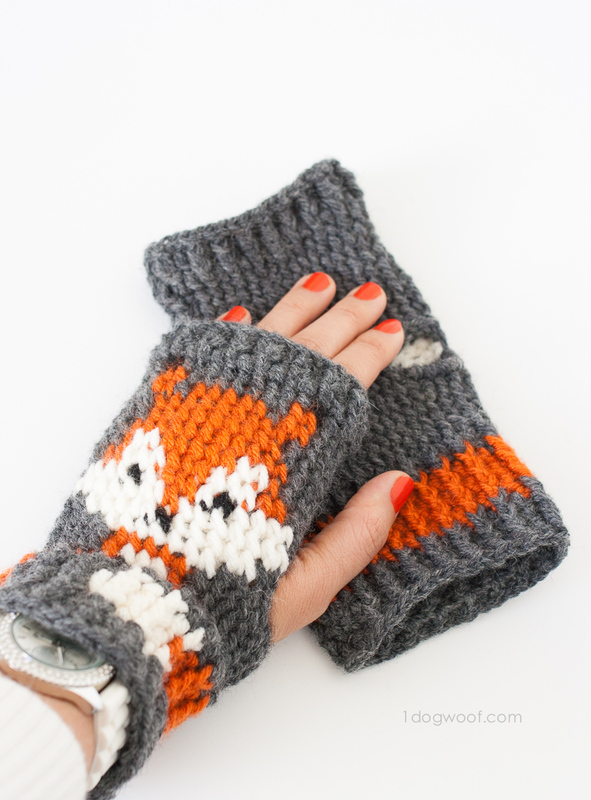 What’s the difference between a fingerless glove and a fingerless mitt and a handwarmer? Po-ta-toe, po-taaaaah-toe. 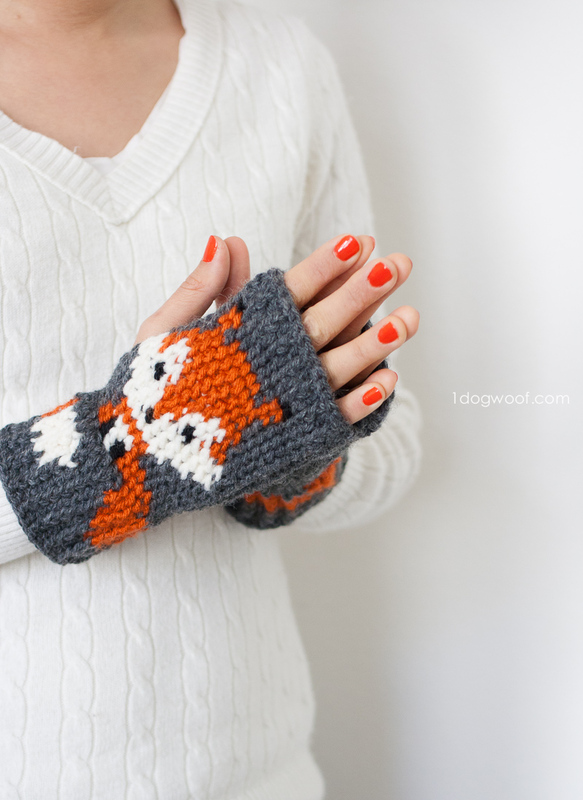 It’s a tube with a hole in it for your thumb, and it’s got a fox on the back, so it’s all good. 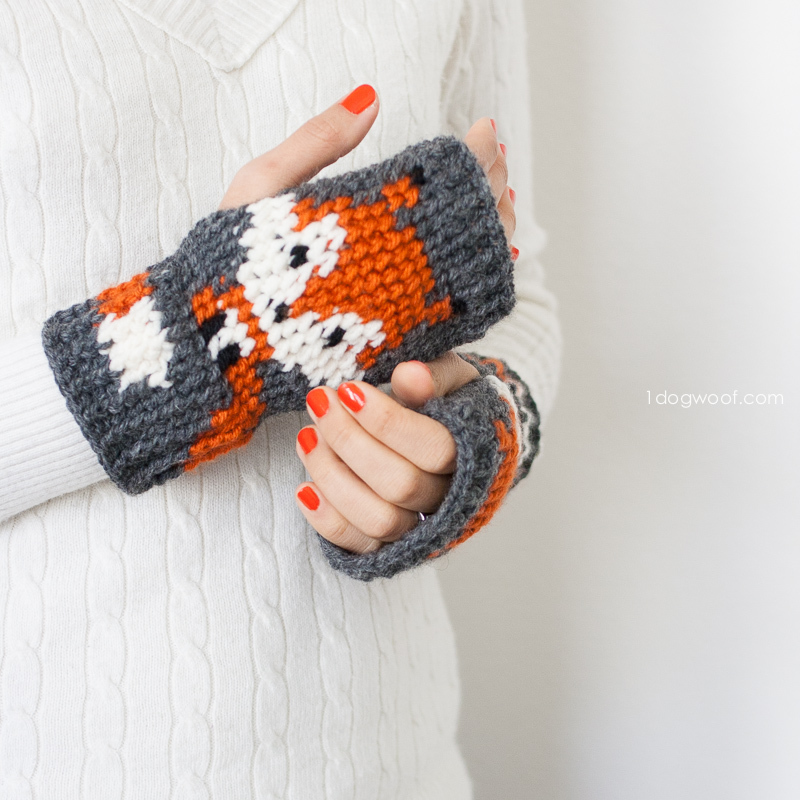 If you’d like to print this pattern, you can purchase an inexpensive, ad-free and comment-free PDF of this fox handwarmer pattern on Craftsy (US only) and Etsy (international buyers, start here!). The file will be available for download immediately after payment. 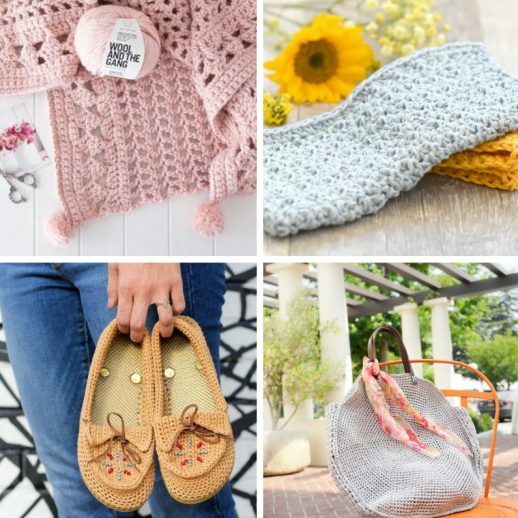 Thank you for helping me continue to provide these fun free patterns! 7 (4.5 mm) and G (4.0mm) hook – Clover Amour Hooks*. (The hook size, yarn and your level of stress during construction will determine the size of your finished handwarmer. You can see the difference in this pictures – both was using the same size hook, but I was more relaxed when creating the right-hand glove. The left one had turned out a bit tight for my hand, so I was also consciously keeping my gauge a bit looser when I worked up the right hand one. 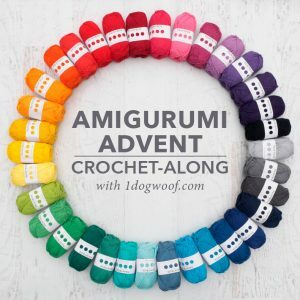 Note: There’s a lot of color-work in this project, and it’s up to you if you want to carry the yarn all the way around, cut the yarn on each round, or carry the yarn back and forth on the back side of the project. 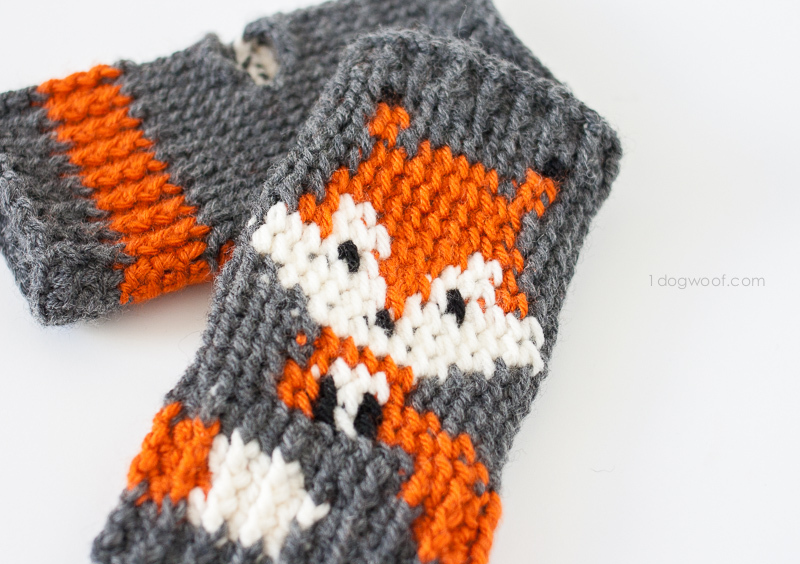 I chose to carry the yarn along the fox part only and brought the yarn back to my active stitch for each round while leaving enough slack for stretch, and then working over/carrying all the yarn bits with my working stitches to secure them in place. Here’s what it looks like from the back. 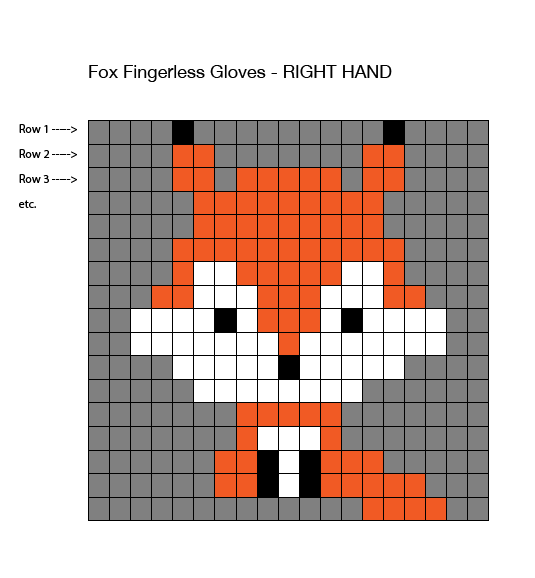 Also, the pattern is worked upside down, as in, I work from the fingers to the wrists, and you need to turn the fox graph upside down and follow the chart from right to left. This is how I created the pattern, so it is what it is. I used a smaller hook for the ribbed sections, since I tend to make ribbing loosely, and I used a larger hook for the graph part because I tend to make that tighter. Using the different sized hooks helped me equalize my gauge. You’ll need to find what works best for you. Round 1: Using the smaller size (G) hook. FSC 35. Join to first fsc. Round 2: Ch 2. Work 1 dc in same st. [Work 1 fpdc in next stitch, 1 dc in next stitch] around. Join to first dc. Fox Graph – every stitch is a fpsc. Each round starts with a ch 1, and the first fpsc is worked into the same stitch as the chain stitch. Round 1-10: Switch to the larger size (7) hook. Ch 1. Work 1 fpsc in next 16 st, then follow the chart on Rows 1-10. Join to first st. Round 11: Ch 1. Work 1 fpsc in next 12 st, ch 5, skip 5 st. The 5th skipped stitch is the first stitch on the chart. Work 1 fpsc into next stitch (2nd stitch on Row 11 of the chart) and continue to follow the chart through the end of the round. Round 12: Ch 1. Work 1 fpsc in next 12 st. Work 5 sc in the ch 5 space. The 5th sc is the first stitch on the chart. Work 1 fpsc into next stitch (2nd stitch on Row 12 of the chart) and continue to follow the chart through the end of the round. Round 13-17: Ch 1. Work 1 fpsc in next 16 st, then follow chart to end of round. 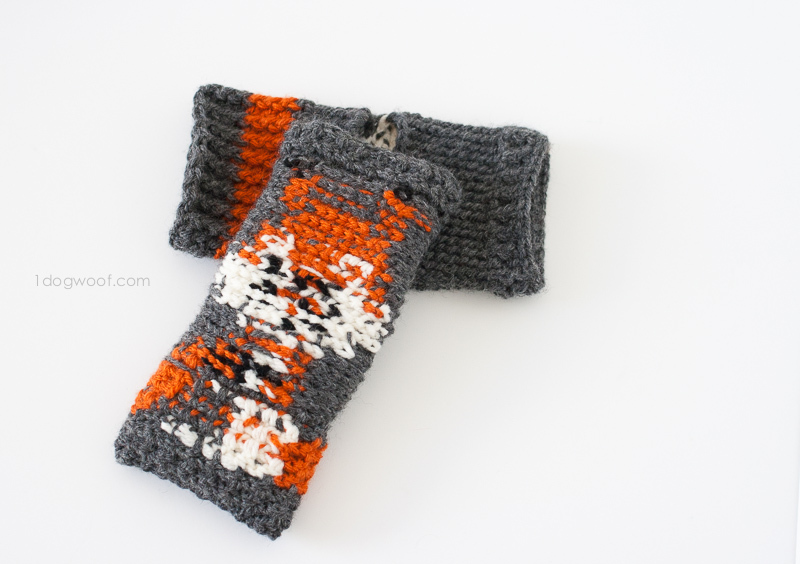 Join to first st.
Wrist Ribbing – ch 2 at the beginning of the round does not count as stitch. Round 1: Switch to a smaller size (G) hook. In gray, ch 2. Work 1 dc in same st. [Work 1 fpdc in next st, 1 dc in next st] 14x. In orange, while carrying the gray, [work 1 fpdc in next st, dc in next st] 2x. Work 1 fpdc in next stitch. In gray, work 1 dc in next st. Join to first st. Round 2: In orange, ch 2. (pull the gray yarn tight, and it’ll look like it disappears). Work 1 dc in same st. [Work 1 fpdc in next st, 1 dc in next st] 9x. Work 1 fpdc in next stitch. In white, while carrying the orange, work 1 dc in next stitch. [Work 1 fpdc in next st, 1 dc in next st] 2x. In gray, while carrying the orange, [work 1 fpdc in next st, 1 dc in next st] 2x. Work 1 fpdc in next st. In orange, work 1 dc in next st. [Work 1 fpdc in next st, 1 dc in next st] 2x. Join to first st. Round 3: In orange, ch 2. Work 1 dc in same st. [Work 1 fpdc in next st, 1 dc in next st] 10x. In white, while carrying the orange, [work 1 fpdc in next st, 1 dc in next st] 2x. Work 1 fpdc in next st. In gray, while carrying the orange, work 1 dc in next st. [Work 1 fpdc in next st, 1 dc in next st] 2x. In orange, [work 1 fpdc in next st, 1 dc in next st] 2x. Join to first stitch. Round 4: In orange, ch 2. Work 1 dc in same st. [Work 1 fpdc in next st, 1 dc in next st] 9x. Work 1 fpdc in next st. In white, while carrying the orange, work 1 dc in next st. [Work 1 fpdc in next st, 1 dc in next st] 2x. In gray, while carrying the orange, [work 1 fpdc in next st, 1 dc in next st] 3x. Work 1 fpdc in next st. In orange, while carrying the gray, work 1 dc in next st. [Work 1 fpdc in next st, 1 dc in next st] 1x. Join to first st. Round 5: In gray, ch 2. (pull the orange yarn tight, and it’ll look like it disappears). Work 1 dc in same st. [Work 1 fpdc in next st, 1 dc in next st] around. Join to first st. Round 6-7: In gray, ch 2. Work 1 dc in same st. [Work 1 fpdc in next st, 1 dc in next st] around. Join to first st.
Fasten off. Turn the glove inside out and weave in all ends. Round 1-10: Switch to the larger size (7) hook. Ch 1. Work 1 fpsc for each stitch shown on Rows 1-10 in the chart. Once you get to the end of each row, work 1 fpsc in next 16 st. Join to first st. Round 11: Ch 1. Work 1 fpsc for each stitch shown on Row 11 in the chart, until the 2nd to last stitch in the row. (18 stitches) Ch 1, and skip the last stitch shown for Row 11 in the chart. Ch 4, skip 4 st. Work 1 fpsc in next 12 st. Join to first st. Round 12: Ch 1. Work 1 fpsc for each stitch shown on Row 12 in the chart, until the 2nd to last stitch in the row. (18 stitches) Work 5 sc in the chain 5 space from the previous row. (The 1st sc in the ch 5 space is the last stitch on the chart). Work 1 fpsc in next 12 st. Join to first st. Round 13-17: Ch 1. Work 1 fpsc for each stitch shown on Rows 13-17 in the chart. Work 1 fpsc in next 12 st. Join to first st. Round 1: Switch to a smaller size (G) hook.In gray, ch 2. Work 1 dc in same st. In orange, while carrying the gray, [work 1 fpdc in next st, 1 dc in next st] 2x. Work 1 fpdc in next st. In gray, work 1 dc in next st. [Work 1 fpdc in next st, 1 dc in next st] 14x. Join to first st. Round 2: In orange, ch 2. (pull the gray yarn tight, and it’ll look like it disappears). Work 1 dc in same st. [Work 1 fpdc in next st, 1 dc in next st] 2x. In gray, while carrying the orange, [work 1 fpdc in next st, 1 dc in next st] 2x. Work 1 fpdc in next st. In white, while carrying the orange, work 1 dc in next st. [Work 1 fpdc in next st, 1 dc in next st] 2x. In orange, [work 1 fpdc in next st, 1 dc in next st] 10x. Join to first st. Round 3: In orange, ch 2. Work 1 dc in same st. Work 1 fpdc in next st, 1 dc in next st. Work 1 fpdc in next st. In gray, while carrying the orange, work 1 dc in next st. [Work 1 fpdc in next st, 1 dc in next st] 2x. In white, while carrying the orange, [work 1 fpdc in next st, 1 dc in next st] 2x. Work 1 fpdc in next st. In orange, work 1 dc in next st. [Work 1 fpdc in next st, 1 dc in next st] 10x. Join to first st. Round 4: In orange, ch 2. Work 1 dc in same st. Work 1 fpdc in next st, 1 dc in next st. In gray, while carrying the orange, [work 1 fpdc in next st, 1 dc in next st] 3x. Work 1 fpdc in next st. In white, while carrying the orange, work 1 dc in next st. [Work 1 fpdc in next st, 1 dc in next st] 2x. In orange, [work 1 fpdc in next st, 1 dc in next st] 10x. Join to first st.
I’m already working on a Monkey version, so follow me on Instagram and/or Facebook to stay up to date on that and other fun projects! 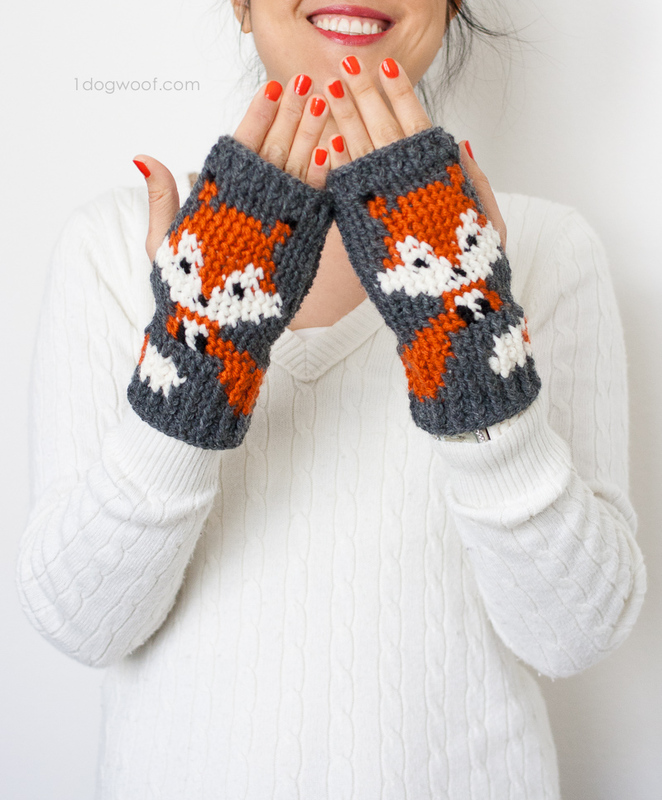 Gorgeous fingerless gloves. I love them. The Clover Amour Hooks are my favorites. Great GiveAway. These are lovely make some. However, I’ve never done anything like this. I can’t wait to try it. I’ve only ever made blankets. If I want more of a thumb on it, how would I go about it? Thank you for sharing this amazing pattern. I love the Amour hooks. Perfect for arthritic hands. 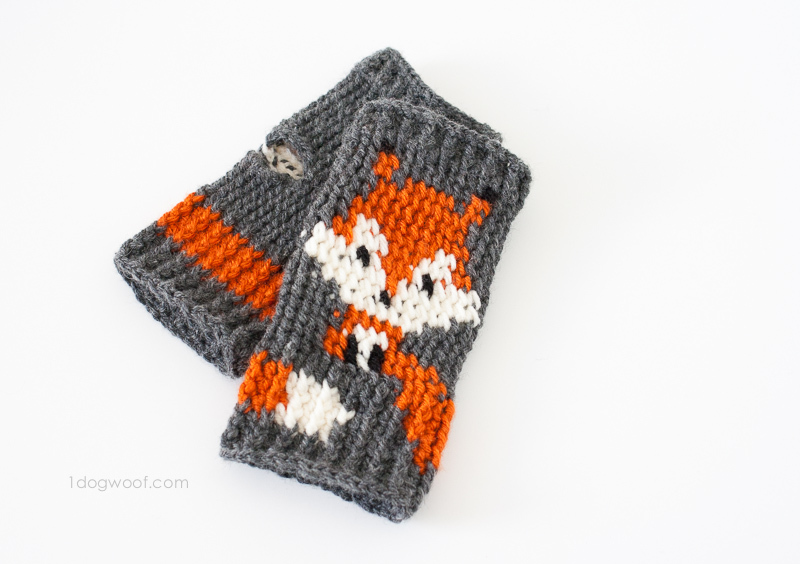 Love the fox pattern. Can you turn the gloves in to mittens? Thanks for the opportunity. I have a few of these Clover hooks and like them…would love to have more! It bugs me just a little that so many blogs depend on Instagram and Twitter – because many of US don’t want to join those sites…I barely have time to visit Facebook, let alone my own email – and don’t want any more “social” internet connections. I have filled out all the possible entries above – without Twitter and Instagram – and will just hope for the best. 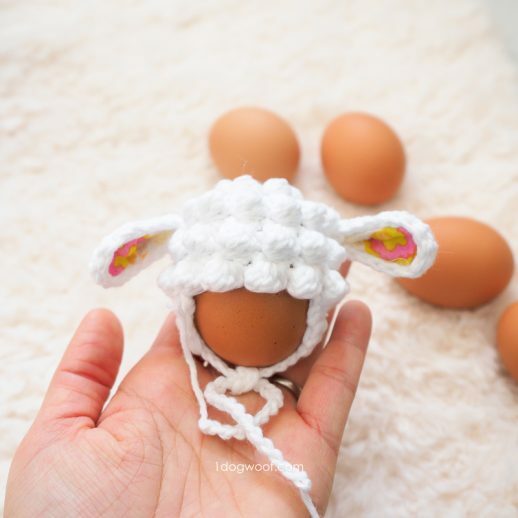 Hi, thanks for the lovely pattern! I was just trying to make it and i dont think i am getting the bigninng right. It looks too big like a lacy collar for a dog. could you explain a little more about the foundation single crochets and th first two rows? I’m not the creator of this pattern, but thought I’d let you know that I didn’t know how to do fsc either and looked it up on YouTube. There is a tutorial on how to do it and it’s pretty simple. I also came out with big collar like but I made the stitches just a tad tighter…enough to fit the hook through w/o struggling. Hope this helps! 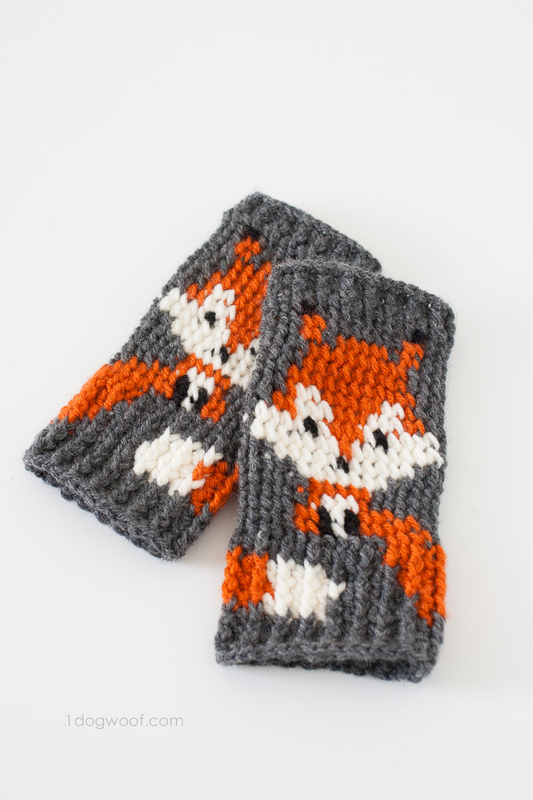 Update on original answer..since I’m not making the fox, I just took 2 foundation single crochets off so it’s 33 and not 35, then on the thumb hole took 2 stitches of from number of crochets, so instead of 12, I did 10. Fits better, not so loose. How can I get ‘one dog wolf’ buttons from you? I like your cozies so I’m making some. Thanks for sharing your thoughts on Gardening. Hi! Would it be possible to crochet this as a flat panel and then just sew up the side to create the mitt? That’s what I’m doing now. I just figured I would follow the stitches minus the fox? Probably, but I’d have to think it through. So Jealous! 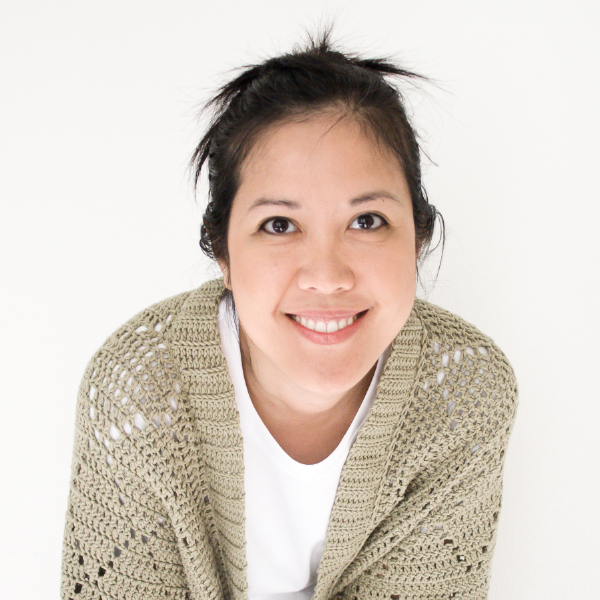 I so wish I could crochet, but alas – it’s not in me. 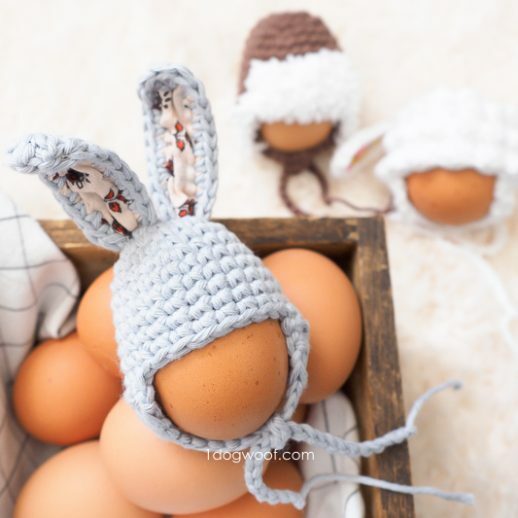 My daughter, however, can crochet, and I will be hitting her up to make me these. They are just too cute! I am new to crochet so I have been buying hooks when needed, be so nice to win a set. Lovely pattern, thanks so much. Help! I’m having SUCH A HARD TIME with this pattern. I’ve googled, youtube, and researched and I can’t seem to get it. I’ve re-done it like 10 times now and still I just don’t understand the ribbing and rounds. I’m going to keep trying until I get it, but any way of getting some pictures to explain it? I’m confused in Round 1-10. I am doing the pattern upside down like you said, but then I get to the round 1-10 and it says to follow the chart. What chart? The fox graph? And am I doing the stitches around or vertical or horizontal? I just need a little perspective because I’m just so frustrated to the point of angry tears at myself for not getting it. Any advice would help! 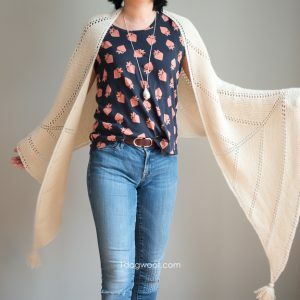 love this pattern, going to have to make it! I’m having some trouble with these fox gloves. I have redone the first couple rows a few times with making tighter stitches & using a smaller hook, but they’re still too big for my hands. Any suggestions? I love Susan BAtes. They hook the yarn better. I think the rounded ones get caught easier on other pieces for me than the susan bates. Also, they do have crochet hook grips. They are just like pencil grips. They slide on the susan bates or any really that don’t have built in handles and work miracles. They are soft and spongy. Just an idea for the susan bate hooks you have, or the ladies who love the head of those better. Thanks for that pattern. Cant wait to give it a try!! 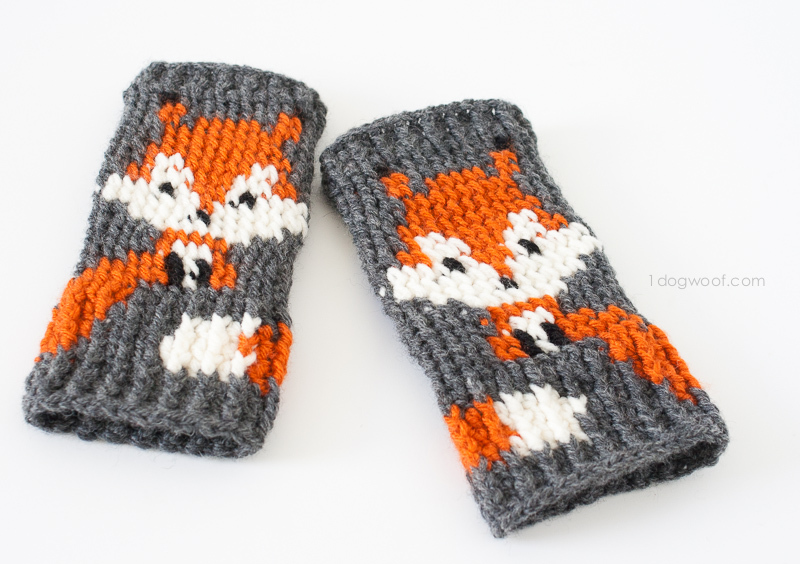 I used this pattern to make a gift for one of my besties and she loves it! the pattern is very clear and well written. It was my first time making gloves with such color work and I’m glad I chose this pattern. Thanks for sharing it with us. These are absolutely adorable. My 3 year old granddaughter would love these. Any way to make them smaller? Would going down a hook size or 2 do the trick? Has anybody made them smaller for a child? omg, I’ve frogged this 4 times now. Just reread it AGAIN and realised I was doing the WHOLE chart and not stopping when I got to row 10! My thumb hole was so far down, but now I understand why. Ok, 5th attempt! I may even just do the chart in SC and only the cuffs in fpsc, works up much faster!